TSP Legal > News > Community News > Colchester Forum Rotary Club’s Choir competition for Junior Schools. Colchester Forum Rotary Club’s Choir competition for Junior Schools. Thompson Smith and Puxon is delighted to once again sponsor the Colchester Forum Rotary Club’s Choir competition for Junior Schools, now in its third year. The 2016 competition will take place over three heats and a final and will see 14 choirs taking part. 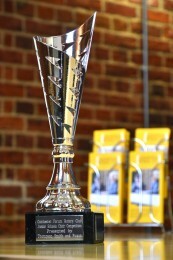 The winners will be presented with a trophy (pictured left) and certificates. Heat 1 will take place on Thursday 3rd November at Thomas Lord Audley School, Monkwick Avenue, from 7.00pm, and will feature Baynards Primary school, Tiptree, Chappel C.of E. Primary school, Colchester High school, Great Tey Primary school, and Langenhoe Community Primary school. Heat 2 will take place on Tuesday 8th November at the Stanway Learning Centre (formerly Alderman Blaxill School), Paxman Avenue, from 7.00pm, and will feature Bishop William Ward Primary school, Dedham C.of E. Primary school, Nayland Primary school, St. Theresa’s Catholic Primary school and St. Thomas More’s Catholic Primary school. Heat 3 will take place on Thursday 10th November at Thomas Lord Audley School, Monkwick Avenue, from 7.00pm, and will feature Heathlands C.of E. Primary school, Highwoods Community Primary school, The Iceni Academy and St. Mary’s school. The top two choirs from each heat will go through to the final which will take place on the evening of Thursday 24th November at the Weston Homes Community Stadium. The order in which the choirs sing will be drawn on each evening, but each choir will sing “I believe” by Lin Marsh and a song of their own choice. The adjudicators, whose job it is to decide the winning choir, are Wade Ablitt, Monica Thomas, Tony Bloom and Ella D’arcy-Jones. In 2015 joint winners of Competition were Dedham C.of.E Primary School and St Thomas More’s Catholic Primary School and in 2014 Bishop William Ward primary school were victorious. 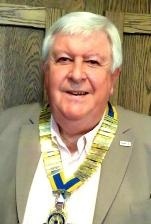 Rotary in Great Britain & Ireland (RIBI) is an association of over 1800 clubs with more than 50,000 members from all walks of life. We welcome new members: female, male, young and old. There are about 1.3 million Rotarians across the world. Our motto is SERVICE BEFORE SELF. In Colchester there are five clubs within the Borough. We are known as the Rotary Club of Colchester Forum and we have over 50 members. We carry out projects to raise money mainly for local community projects and some international ones too. We also organise social events and have fun!! My chosen charities this year are AgeUK Colchester, the local branch of the Samaritans, and Beacon House, a project for the homeless based on East Hill. We will be holding The Big Sleepout next to Castle Park soon. Internationally we respond to human tragedies such as earthquakes and we also raise money to support the eradication of polio in the world, and there are just a few cases left in three countries now. Our club is very active in a hands on way supporting local schools with the Junior Choir Competition, and Youth Speaks – a public speaking competition held in front of the Mayor in the council chamber at the Town Hall. We also assist with mock interviews and career talks for older pupils and a lot more. This is the third year of our Junior Choir Competition and it is lovely to see the children becoming involved and enjoying themselves. Those who take part will remember and benefit from the experience for the rest of their lives. Finally, when you see our logo and we are out in the rain or in freezing weather at Colchester North Station (I don’t mind if you laugh at me dressed in my Father Christmas outfit so long as you part with some money! ), or in the entrance hall of a supermarket collecting for a good cause, please support us.